The array of cat feeders that is now available is indeed surprising. 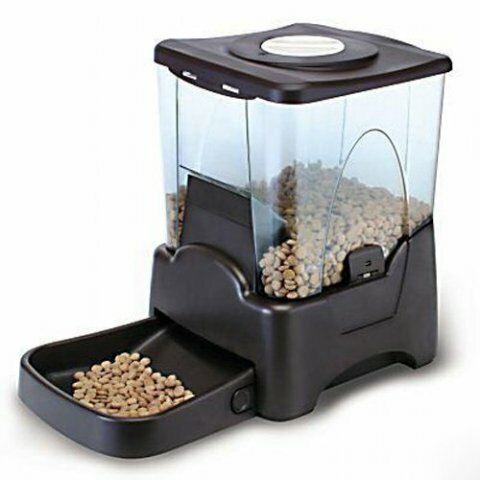 From the most basic two-bowl feeders which cats can easily topple or eat out of whenever they want, to cat feeders that can be programmed to dispense the exact amount of food at a pre-determined time, cat feeders have definitely gone hi-tech. Here is a list of 11 cat feeders that will inspire to find one that is most suited to your and your cat's needs. Bergan Petite Gourmet Combo includes a feeder (6lb capacity) and water fountain (1.5 gallon capacity). The wide openings make for easy filling and cleaning. The food and water slide down and fill the bowls for the pets to eat and drink. Most users like the product for its sturdiness, the amount that it holds and the size of the bowls. Not for cats that are uncomfortable with the gurgling sound the sound the water makes when flowing down into the bowl! The combo is available at Amazon here. The PetSafe Eatwell Electronic Cat Feeder will ensure that your cat gets the right amount of nutrition at the right time. 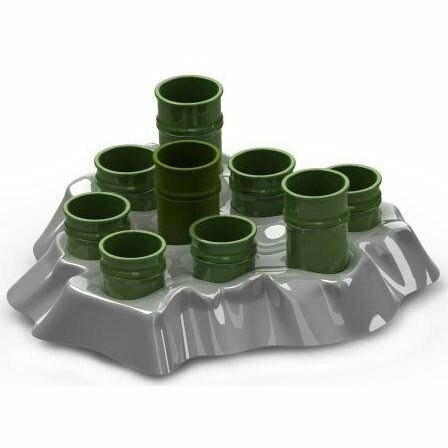 The tray has five 1-cup capacity food holders and is dish-washer safe. Most users have liked the product however some really smart cats were able to beat the system and rotate the tray with their paws. This is available at Amazon here. 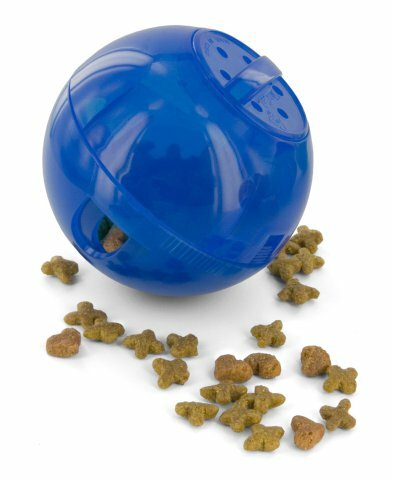 The PetSafe SlimCat Meal Dispensing Cat toy is a perfect option to make that lazy cat of yours work a little for its meal. It is available in four very attractive colors, and works well especially for over-weight cats. 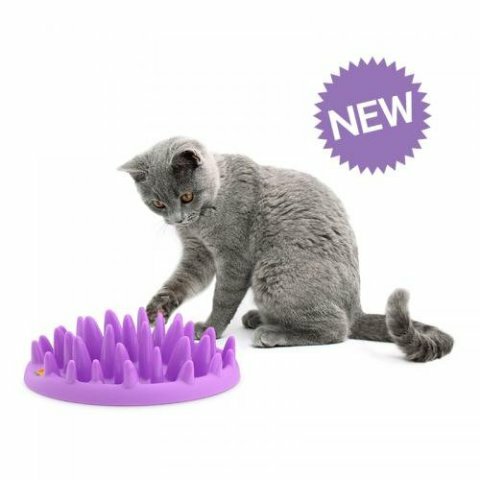 Cat owners have recommended it especially for cats that need to exercise themselves, and most cats are able to work out the mechanism and get their food as they play with it pretty quick. Available at Amazon here. Trixie Tunnel Self Feeder feeds the cats as they poke and play with it, releasing a small amount of food in one of the six tunnels with each poke. Output levels can be adjusted and in this case at least, curiosity will feed the cat. Users recommend it as it allows them to control portion size. Available at Amazon here. 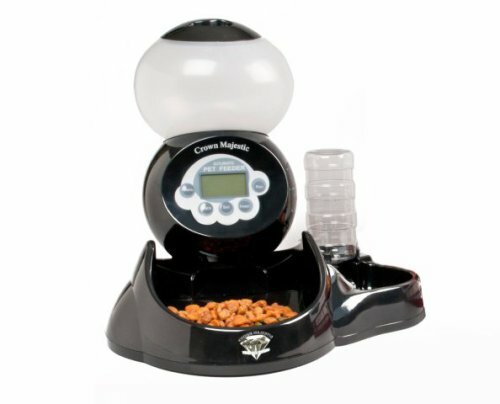 The CE Compass Large Cat Feeder Programmable Portion Control with LCD Display allows you to completely control the feed intake of your cat - by portion and by frequency. While users are raving about how convenient it is, some have complaints about the lack of accuracy in portion size dispensed. Available at Amazon here. 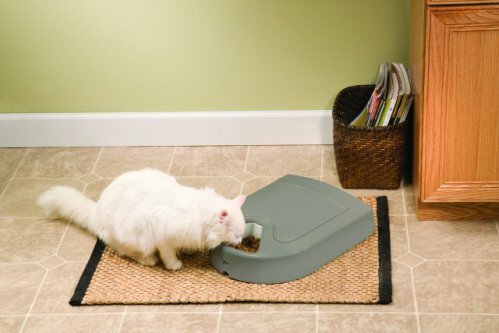 PetSafe Healthy Food Station comes with a removable and easy to clean stainless steel bowl. The small size makes it ideal for tiny spaces. Most users, especially those with cats being allergic to plastic, find it useful because of the stainless steel bowl. The food portion however cannot be controlled and trickles down as soon as the bowl is empty. Available at Amazon here. 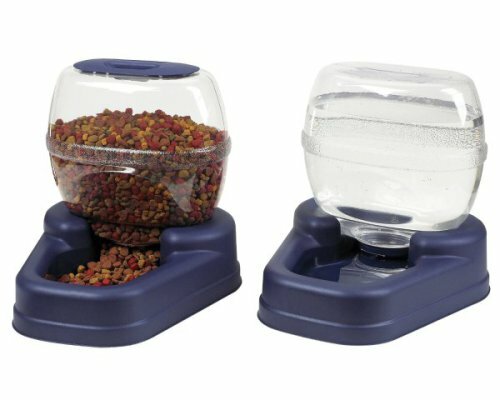 Automated Pet Feeder for Cats is a patented and and adjustable flex-feeder that can dispense food from 1tsp to 6 cups. The feeder is equipped with a water tray to protect the food from ants. It can program up to five meals per day and holds 10lbs of cat food. Buyers of this products have expressed great satisfaction at how this product made their life much simpler. Available on Amazon here. Northmate Interactive Slow Pet Feeder is another product that helps cats take in their food a little slower. Cat owners whose cats gulp down their food extremely fast, have really found this useful with 30seconds feeding time increasing to almost 10 minutes on an average. The product is dishwasher safe. Available at Amazon here. 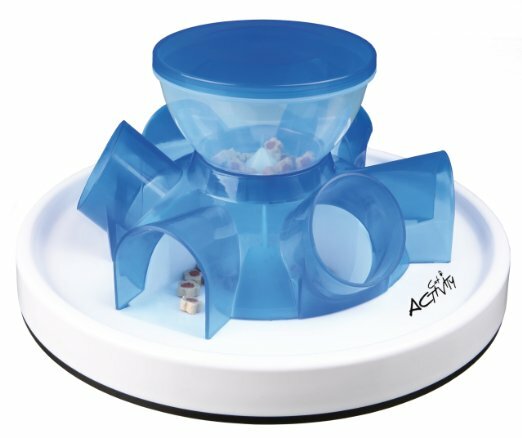 Aikiou Stimulo Activity Food Center for cats is easy to clean and dishwasher safe. Along with food, it also feeds the natural tendency of cats to hunt for their food! It reduces the speed of eating, making cats less prone to vomiting. Available at Amazon here. 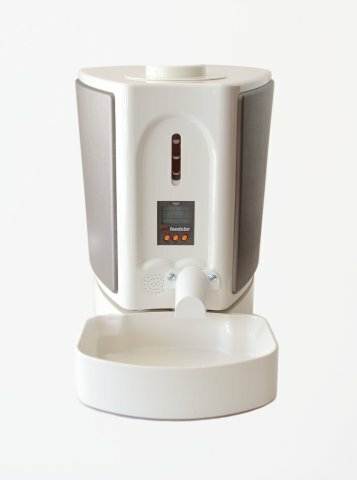 Crown Majestic Diamond is another automated food and water dispenser with fairly simple programs. 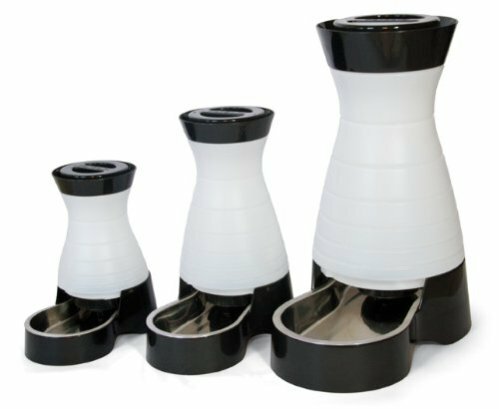 It dispenses food in different measures - from 1/4 cup to 2 cups. It holds about 4.4 lbs of food and even alerts the pets with a 12 second message when it is time to eat. Easy to use and makes feeding very convenient. Available at Amazon here. 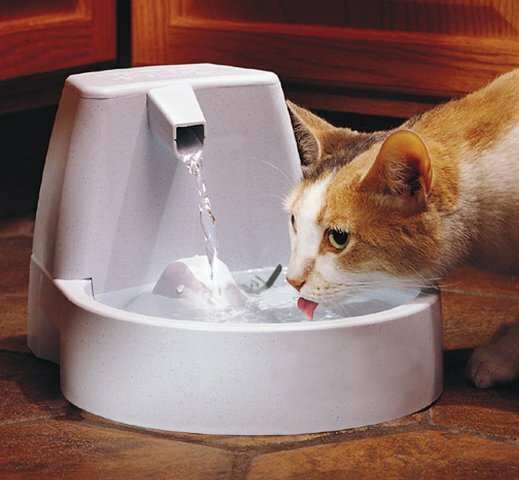 Drinkwell Original Pet Fountain is well, a fountain! The constant stream of water encourages cats to drink more water. It has charcoal filters, and is especially recommended for older cats. The product however needs you to maintain water levels otherwise the pump creates more noise. This is available at Amazon here. The range o cat feeders is truly amazing. Take your pick based on your cats' needs and of course keeping in mind their quirks. All cats seem to have some!